One of the most well-known pirates in the world, Blackbeard is a prominent figure in North Carolina history, having been brought to justice here 300 years ago. As we celebrate the 300th anniversary of his death, we’ve unearthed this treasure of a beer for your enjoyment. This hoppy blonde ale is light and refreshing, but is also brewed with Amarillo and Chinook hops, adding a fruity, bitter punch to the finish. 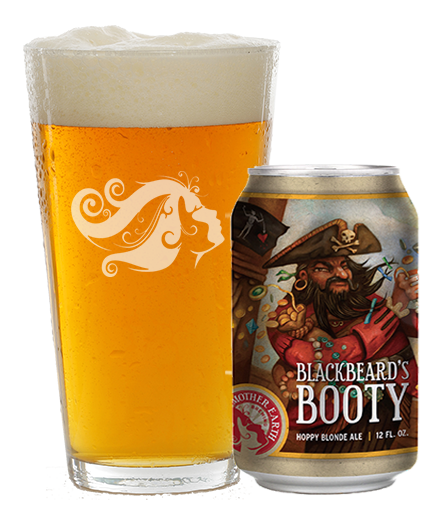 Enjoy Blackbeard’s Booty while you celebrate the pirate within you! "If you're looking for an easy drinking, light, but hop forward beer, this is your ticket. Low alcohol by volume with a touch of hops makes this my favorite beer at the moment."